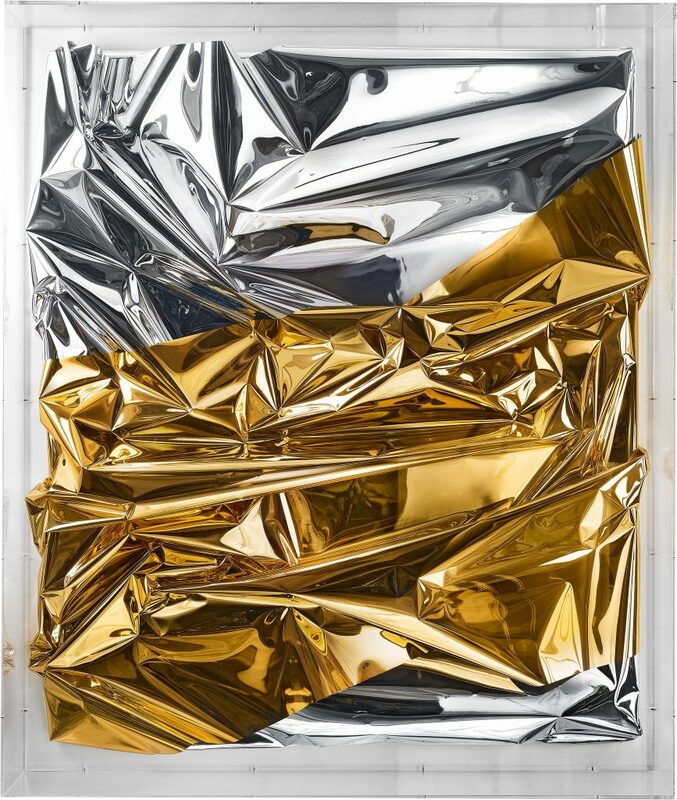 Almine Rech Gallery is pleased to present Laguna Sunrise, Anselm Reyle’s fourth solo exhibition with the gallery. 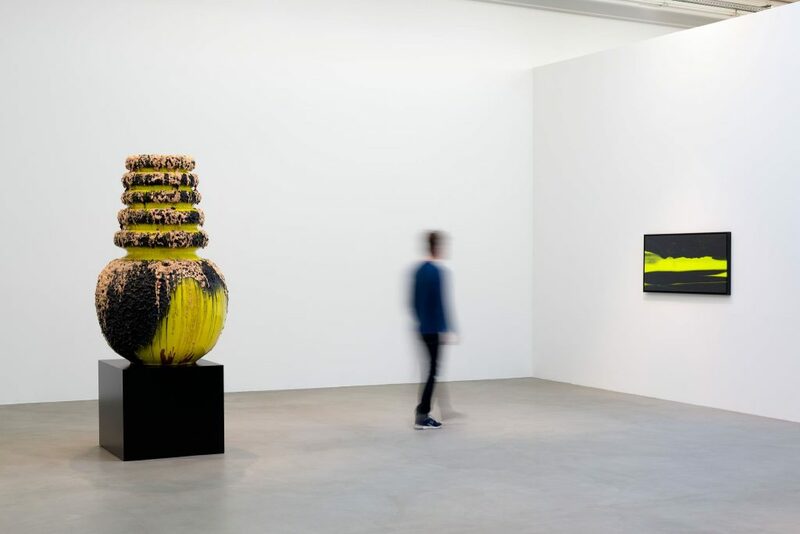 This exhibition presents five large ceramics by Anselm Reyle, along with new bodies of paintings. 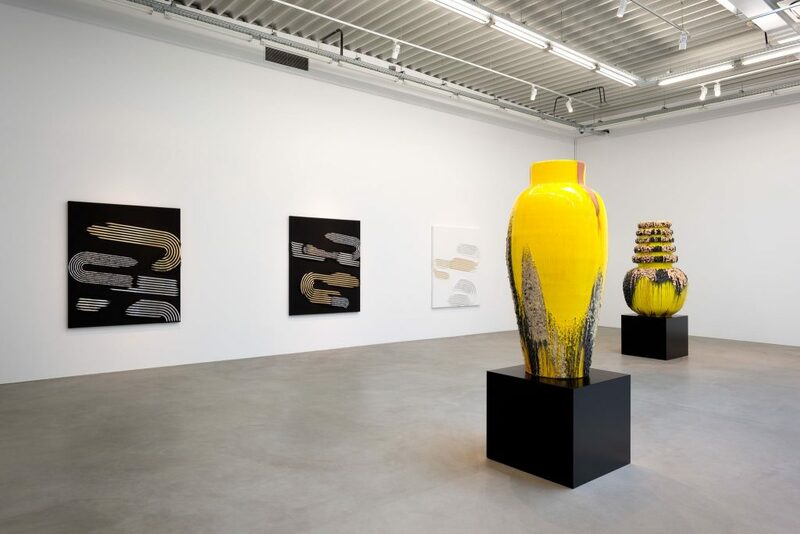 Monumentally presented on plinths, the handmade vases in the ceramic style of Fat Lava are larger than life-size. This way, at eye level, the glazed drippings can be appreciated like paintings, and the vases are relieved of their utilitarian status. Individual drippings form layers, and at times the colors flow into one another with a marble-like quality, while in other places, the rough lava-like surface is prominent, with the anthracite-colored encrustations and crater-like pores contrasting the strong colors underneath. Regarding the form, Reyle orientates himself by the shape of original Fat Lava vases, which he simplifies and enlarges to a great degree. The term Fat Lava refers to a particular style of glazing that was developed in the 1960s and is reminiscent of the large pores found in solidified lava flows. 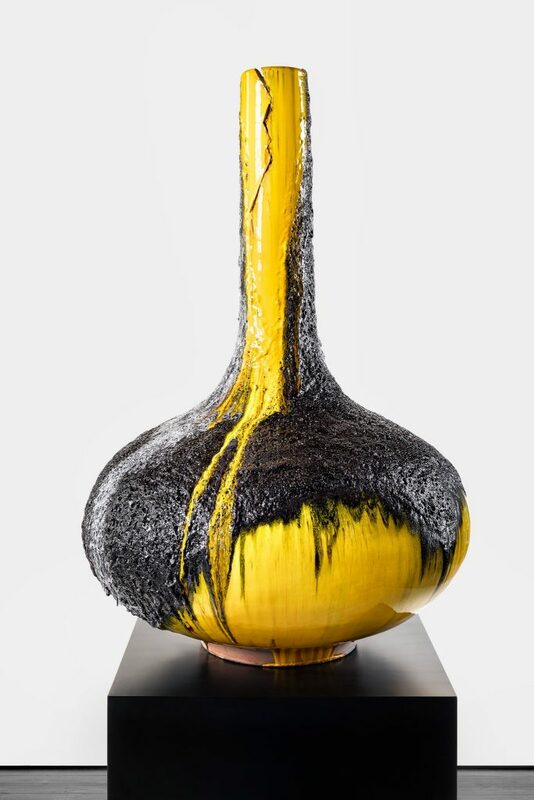 These days, however, in professional circles, Fat Lava is now generally associated with West German ceramics from the 1950s to the 1970s, which are characterized by bold colors, striking glazes and experimental combinations using the most varied of forms. After the war, these pieces were for the most part industrially produced—an approach that emerged from the democratic desire for universal accessibility and simultaneously led to an ambivalent situation for the ceramics factories, which began to focus on mass production rather than creating elaborate single pieces. Despite their simplified form, streamlined for industrial production, the vases stood out from other ceramics due to their use of new glazing techniques and bold colors, which were applied by hand. In addition to the primarily dark matte Fat Lava glazing, carmine red, bright yellow and cobalt blue are among the colors representative of this style. In contrast to the semi-industrial origins and short production times of the original Fat Lava ceramics, the vases for Reyle’s series were painstakingly created in collaboration with traditional ceramicists due to their large size and highly sophisticated glazing processes. 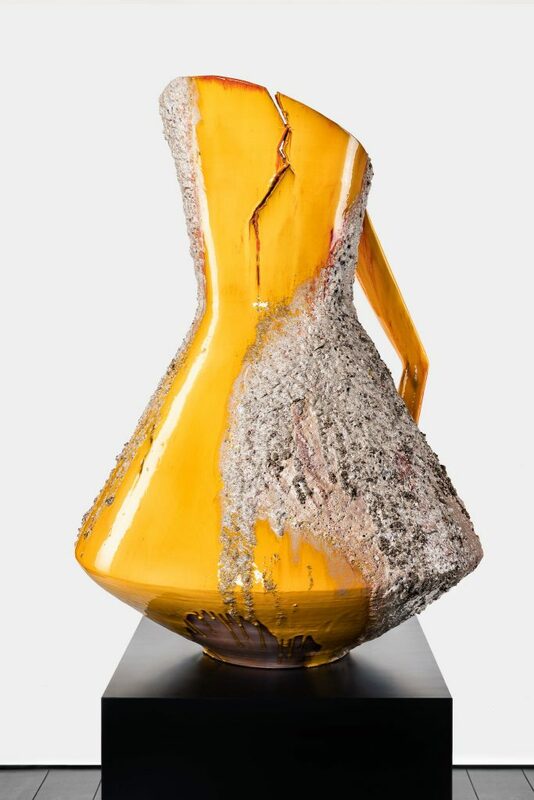 A notable feature of Reyle’s vases is that they all have cracks or deformities in the body or neck. Impressed by Japanese ceramics and the philosophy behind them, Reyle has adopted their appreciation for subtle defects. In accordance with the tradition of Kintsugi, a crack or fracture is no reason to discard a piece—rather, it is to be appreciated and preserved in its imperfection. Such flaws are even emphasized. 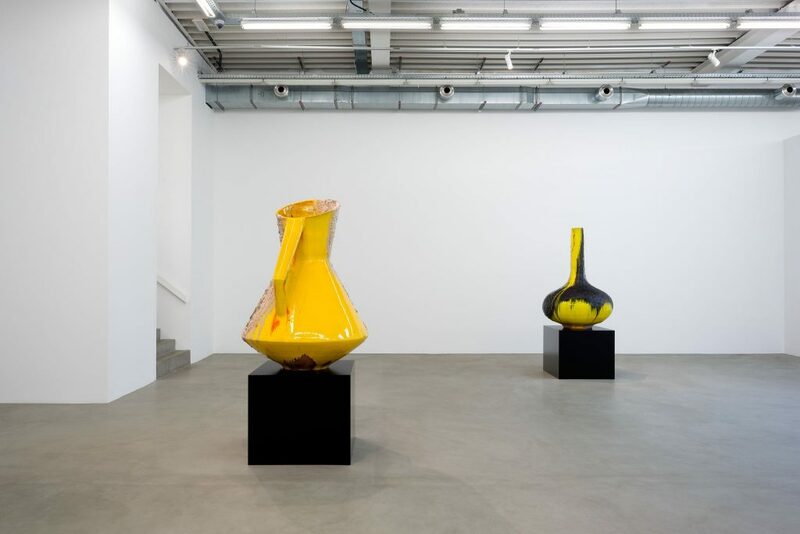 Reyle staged these accidents intentionally, handling the vases before firing them and inflicting almost exaggerated cuts, dings and dents. This can be seen as an example of Reyle’s consciously playful approach to breaking with perfection and straightness. It recalls Reyle’s now-trademark splotch, which at the time was applied like a signature to his perfectly executed stripe paintings. The large ceramics were the first body of work Reyle introduced after taking a production and exhibition break of more than two years. The bizarre Fat Lava ceramics have previously appeared in Reyle’s work as vases or lamp stands though—these objects, however, were originals found in flea markets and online auctions. The use of found objects of dubious taste is a cornerstone of Reyle’s oeuvre. Conceptual references to his so-called “African sculptures” can also be made. Like the vases, these were based on ordinary small originals, simplified in form and enlarged to far greater proportions. Or, one might also make comparisons with Reyle’s nostalgic farm equipment, which is honored in its formal features and obtains a new level of attention through contextual alienation. 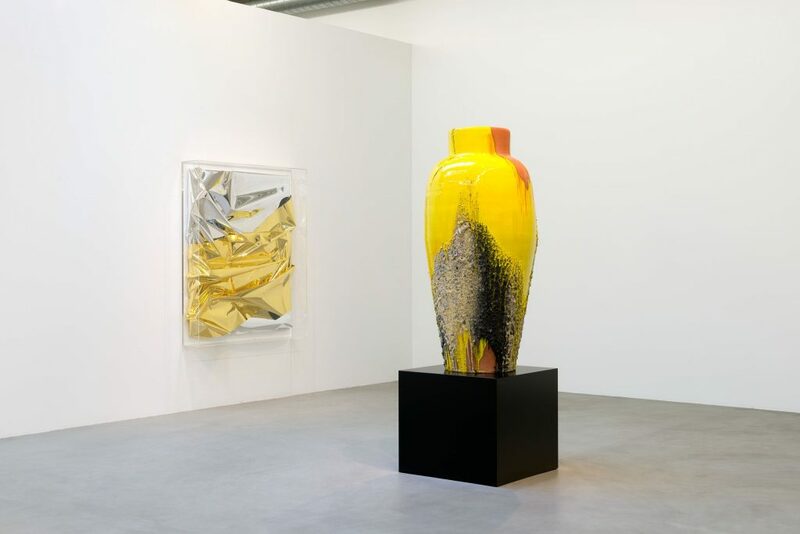 With this exhibition Anselm Reyle also introduces new bodies of paintings. In the untitled works from the series Zen Paintings, a raked pattern is drawn across the canvas in uniform tracks. 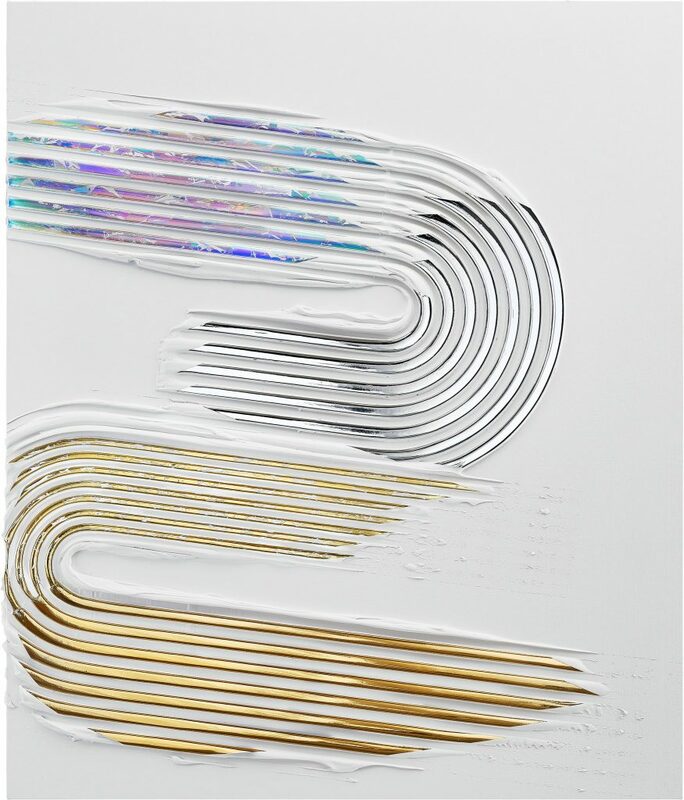 The elevated lines produced with modelling paste shine in different metallic hues. 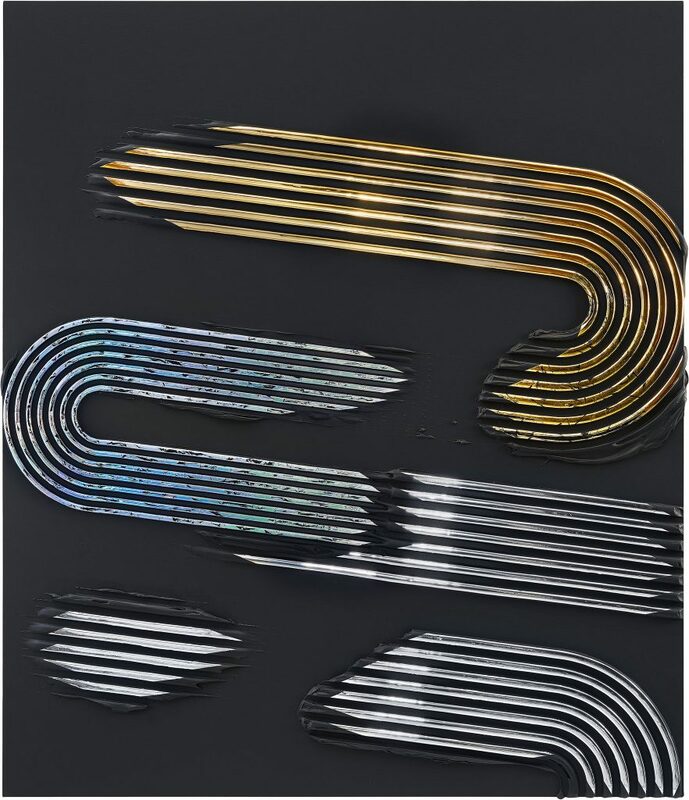 In some parts, geometric shapes are covered with strips of high-gloss chrome foil, while other areas have been refined through the traditional technique of applying gold leaf, and yet other parts are lacquered and sprinkled with holographic glitter. The high-gloss finished lines appear like three-dimensional chromed parts from tuned car interiors, yet at the same time, the entire composition recalls the quiet contemplation of a Zen garden. 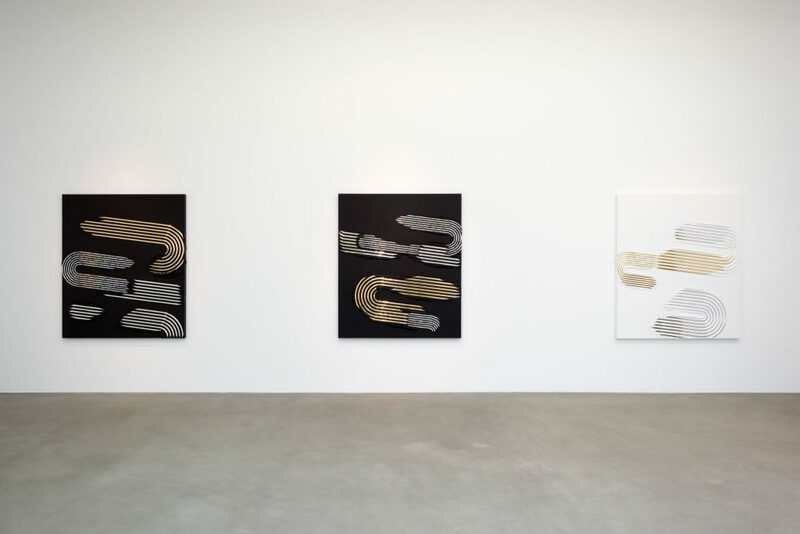 The acrylic pastes and surface structures are drawn from the characteristic material canon the artist has developed over the past two decades. The structural pastes, which are commonly available in arts and crafts stores, were notably used in his gestural Black Earth Paintings, which combine art historical references with the figure of “creativity in buckets,” referring to the buckets of modelling paste which are used in the paintings. In contrast to the explosive gestures of abstract expressionist painting, the Zen Paintings show a reduced, controlled and almost meditative use of line. The pattern continuously dissolves, especially towards the edges, with emptiness and density held in a dynamic balance. For the untitled Scrap Metal Paintings, Reyle arranges different forms of metal shavings and other scraps on a black surface, sealed within a transparent acrylic glass box. The sometimes high-gloss and filigree spirals made of aluminum, steel and other metals are transformed into a subtly three-dimensional drawing, which, depending on the viewer’s perspective, lies between raw materiality, unreal depth of field, and digital picture noise. 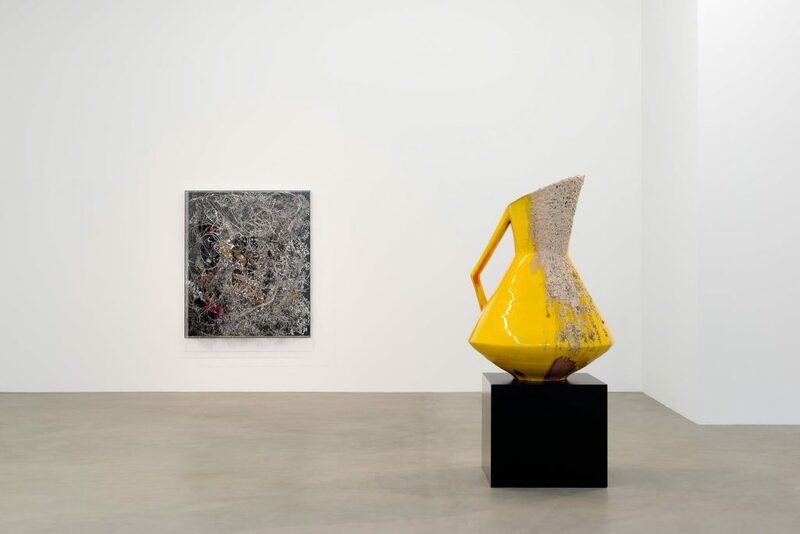 Like an alchemist, the artist transforms the metallic detritus of highly engineered production processes—upon which the contemporary material world is based—into valued relics of the same. 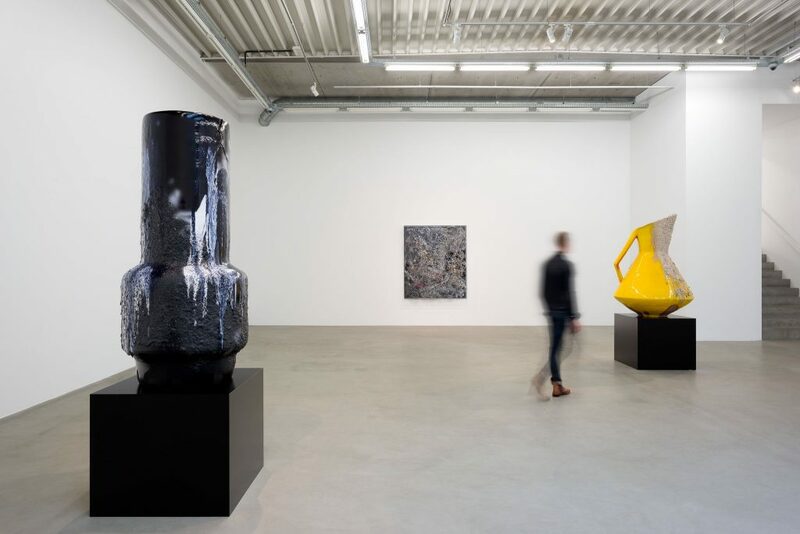 A smaller work in the back of the exhibition shows a rather unusual subject within Anselm Reyle’s oeuvre—a landscape view in psychedelic colors. At the second glance it becomes clear that the forest view originates from color flows crossing each other, resulting in forms evocative of trees and a lakeside. The artist made large drip paintings by combining neon colors and black lacquer, only to discover landscape imagery in the dried compositions later on. Synchronistically, this moment of coincidence connects back to the vases’ glazing process, where the results are certainly anticipated, but never fully determinable until the work is complete.